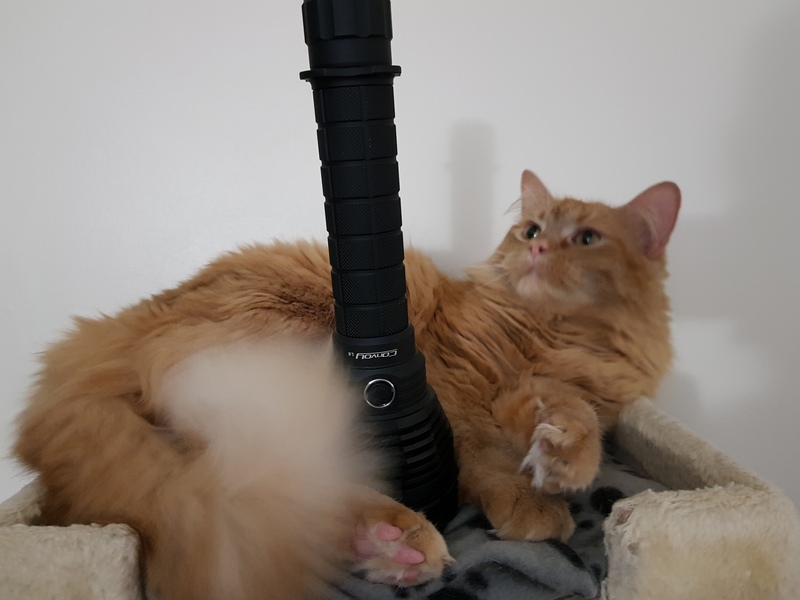 To start things off: I was contacted by Thorfire, the manufacturer of this flashlight, and offered a 99% off code for Amazon if I was interested in reviewing this product, the Thorfire VG-10S. 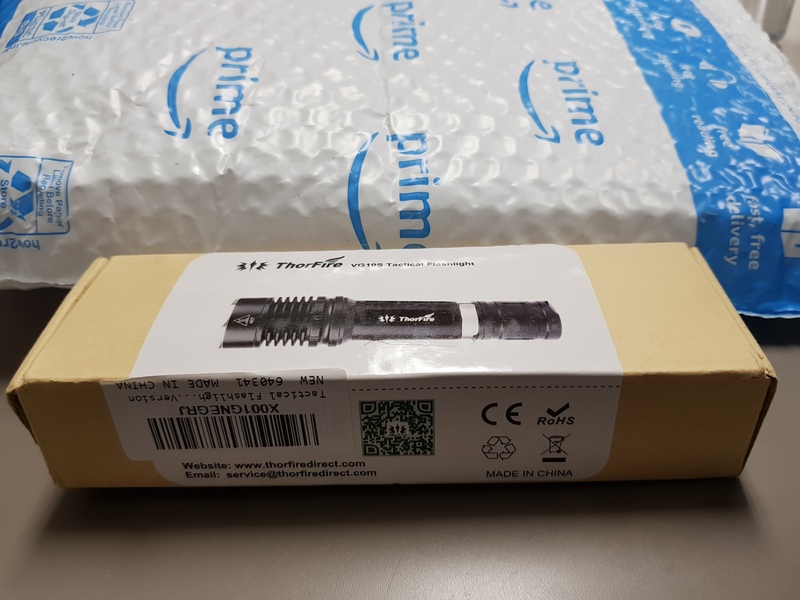 I accepted, knowing that it wouldn't influence my review (only my excitement to jump around shouting “free flashlight!” while waiting for it to arrive). So, here goes. Edit: ThorFire has asked that I include a 20% off code for the light. 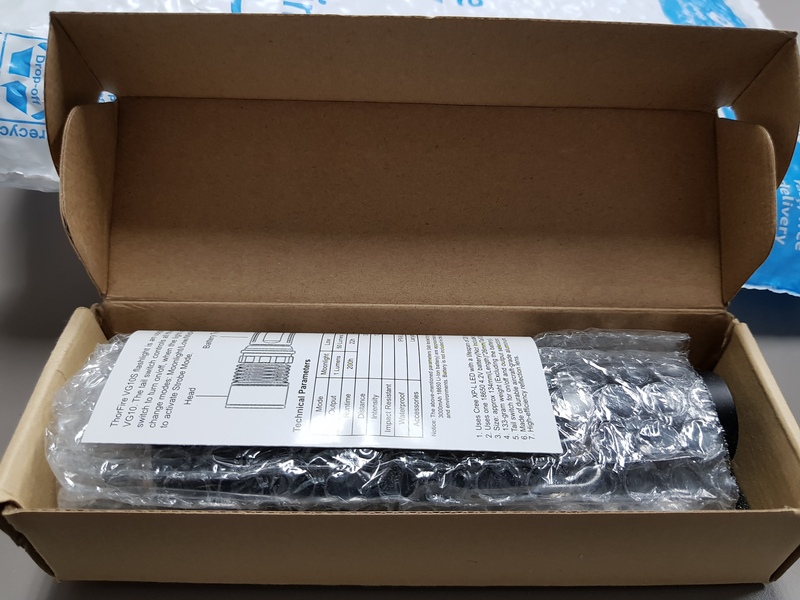 Packaging: The packaging came in a pretty standard box. The contents included the light itself which had the pocket clip pre-installed and was within a bubble-wrap sleeve. There was a thin piece of foam at the bottom. There was also a brief instruction booklet as well as two spare O-Rings. I promptly set everything else aside and opened the light. Build Quality: The light itself is a bit hefty. 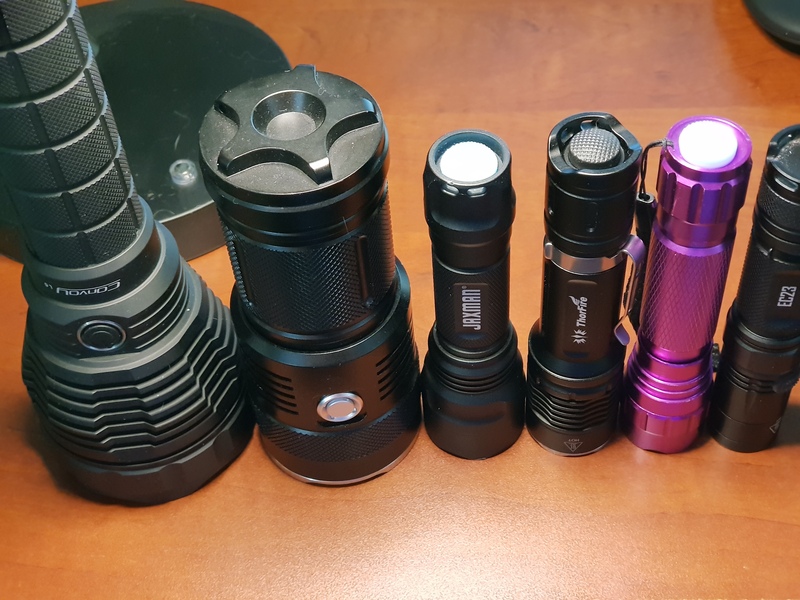 It's larger and heavier than my tube-18650 lights, and harder to carry even than my largest tube-style 18650 light, a Nitecore EC23. 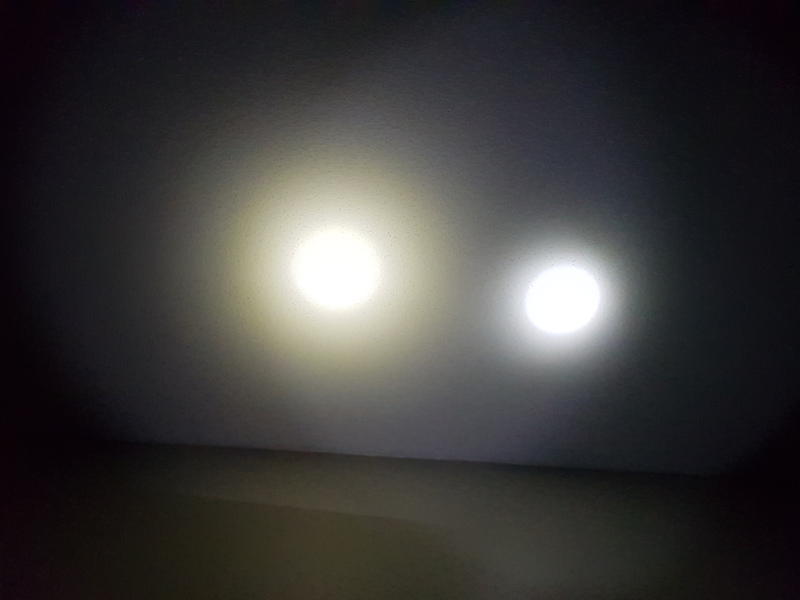 This is mostly because it has an enlarged head surrounding its smooth reflector and Cree XP-L2 emitter. The head is smaller than the Jaxman M8, to give you an idea of size. The threads were well-lubed (and square cut) and the anodization had no flaws that I found. The light lacks knurling, but is easy enough to hold without dropping due to the alternate grip-features added. There was one small flaw on the bezel, but after rubbing my fingernail across it several times, I can no longer feel it. The bezel itself is silver (I assume stainless steel, but have no clue), standing out from the black light. It has mild crenellations, so it won't shred your pocket but you'll know if it's been left on while head-standing. The tail switch has a typical rubber boot, though on my example the switch mechanism itself has significant sideways movement, reminiscent of those old laptop "pointing sticks". 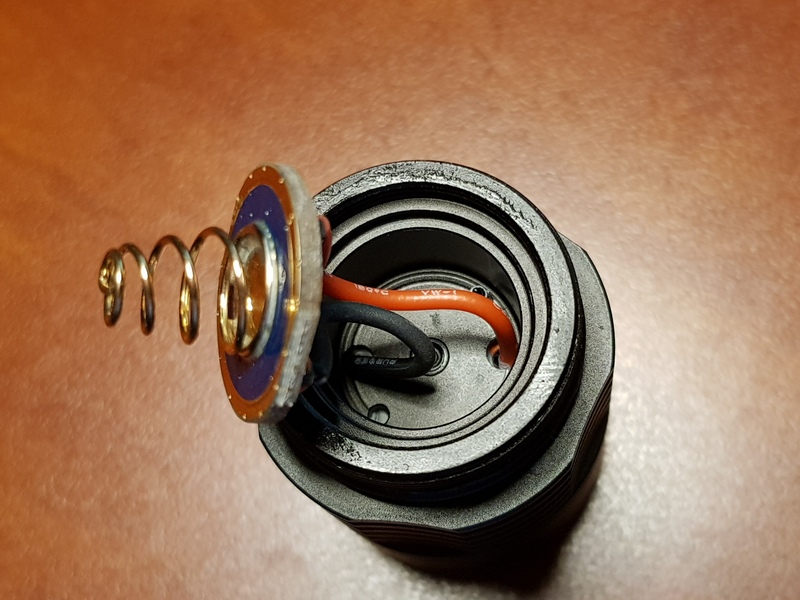 Feel: I opened the light and slid in my largest protected 18650 (this one gets stuck in my Jaxman E2L, and has to be gently pushed from the other end). It fit easily, with room to spare - in fact, the battery rattles if the tube is tapped. 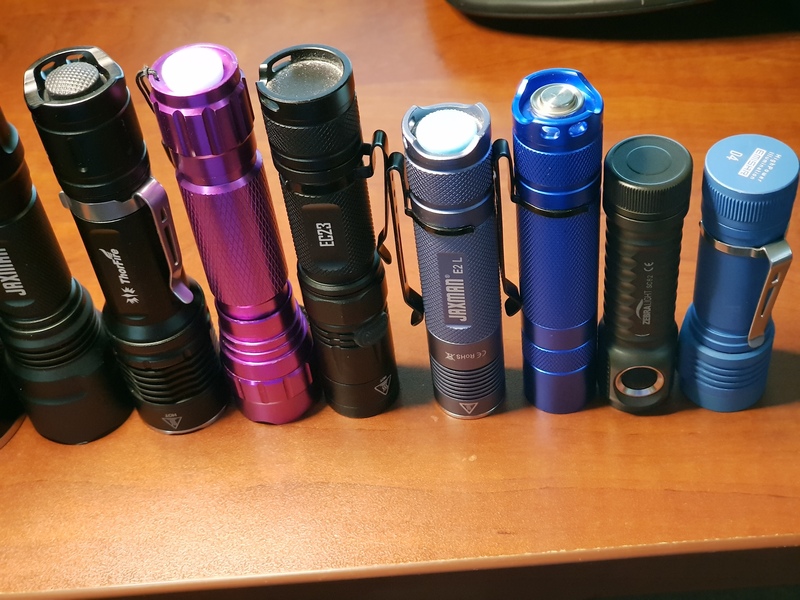 The light's easy to hold and use. It's not nearly large enough to be cumbersome to hold, though I can't think of any single-18650 lights that are. Having an enlarged head, it's going to be out of the pocket-carry/EDC category for most. I can manage it in my pockets, having a larger build and a cargo-pant preference, but I still find myself preferring something Convoy S2+ sized (or smaller). The pocket clip is sturdier than the non-screwed clips for the Convoy S2+, though the carry is much shallower. In fact, it hurt my fingers a little to try to remove the pocket clip. 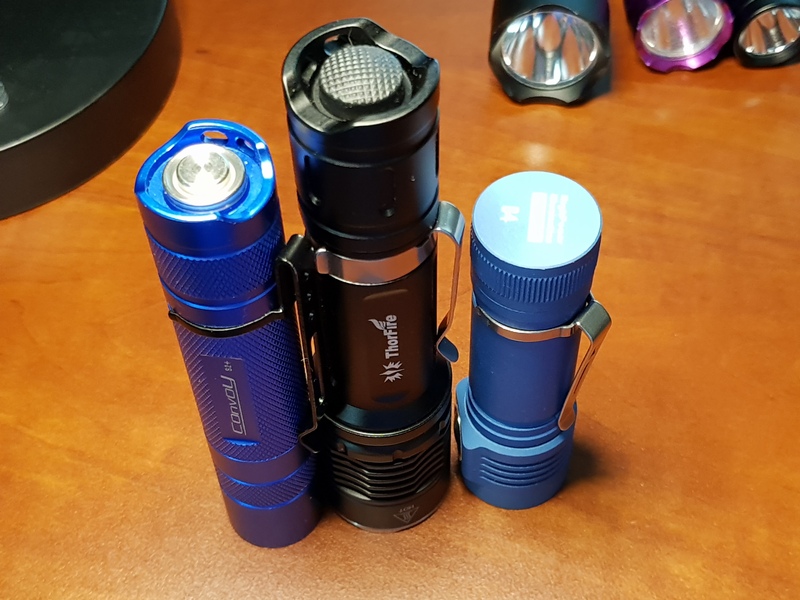 The head gets nearly uncomfortable to hold when left on high for a prolonged period, but never reached Emisar D4 levels. I found the programmed-in ramping sufficient for thermal management, and in normal use I never noticed it warming at all. The modes have a strange feeling to them, though. The moonlight is perfect, and actually a moonlight. I can look directly at the emitter without pain (anything else is, to me, just a "very low" setting). That said, I don't think low is low enough compared to the moonlight, and I also think Low to Mid to High isn't spaced far enough apart. The light has memory, so often I'm confused what mode I've left the light in when I first turn it on (unless it's moonlight). 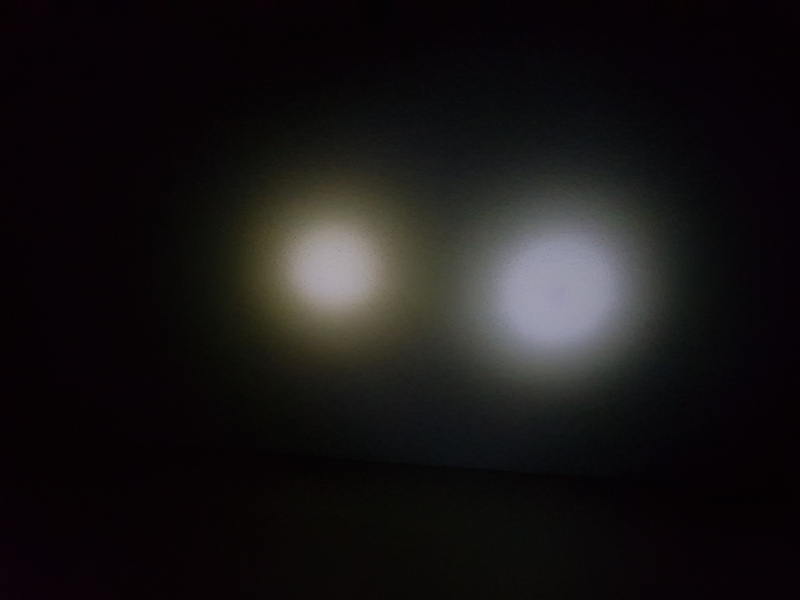 Light Output: I don't have access to an integrating sphere or a lux meter yet, but I trust the outputs on both my Nitecore EC23 and Zebralight SC62 to be in the right ballpark. 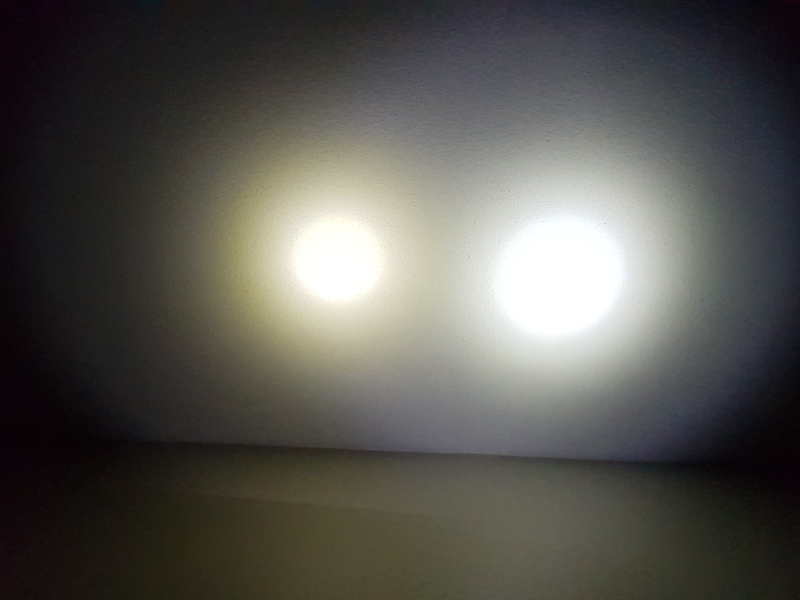 Comparing between various modes, I don't doubt the output claims of this light at all. I'm sure there is some variance, but they're not being dishonest here. The beam pattern leaves something to be desired. I haven't owned a domed XP-L2 before, and when I tracked down some white walls I discovered quite the yellow donut surrounding the hotspot. The much cooler spill has a couple rings to it and the hotspot (unsurprisingly) isn't as crisp as on my Jaxman M8, with a larger reflector and domeless XP-L HI. The timed step-down on high sneaks up on you, and is very smooth. I always notice every output stepdown my D4 makes, and it's not the case here at all. 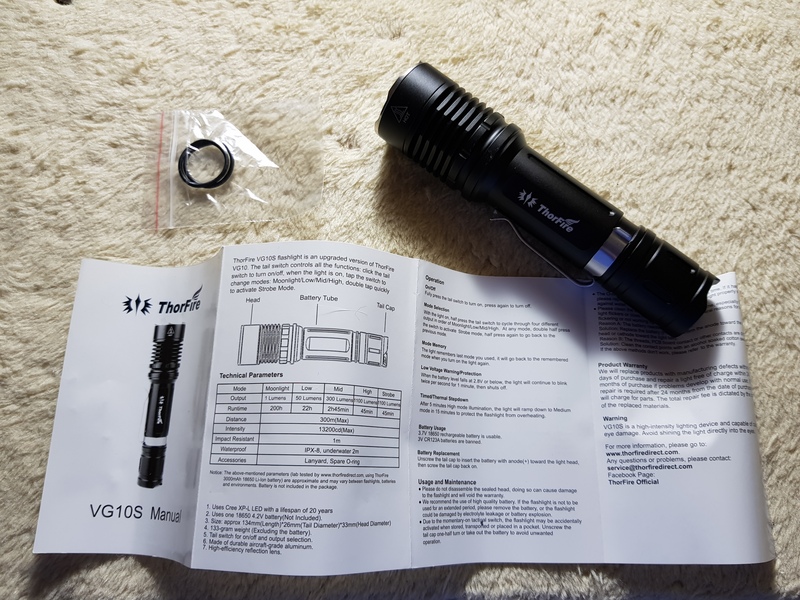 The overall light output is fine for normal carry use, and I didn't find myself wanting for another light in any situations where I wouldn't feel the same with all my other single-18650 lights. 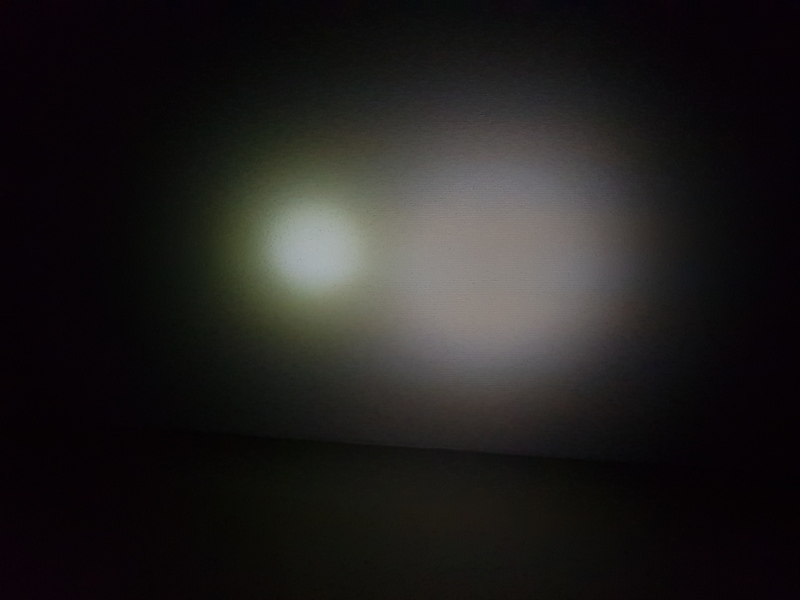 There's also a strobe mode on this light, which is somewhat hidden (I only activated it accidentally once, on my very first use of the light). It's activated by a double-half-press. Now, it's possible to trigger when cycling modes quickly, but I didn't have any issues avoiding that. 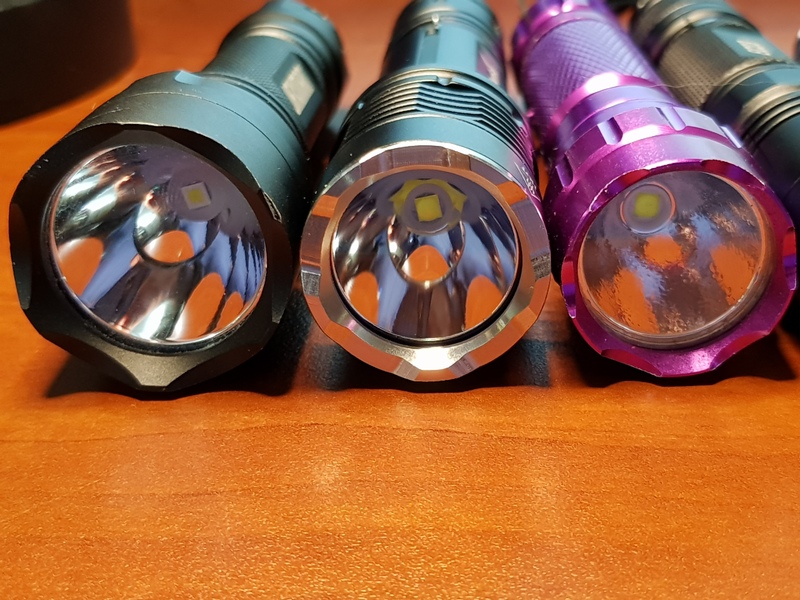 If I really needed to get to high mode AS FAST AS POSSIBLE, I'd be using a forward-clicky light that was H-M-L every time (or something similar, Streamlight style). That's not what my carry lights are for. 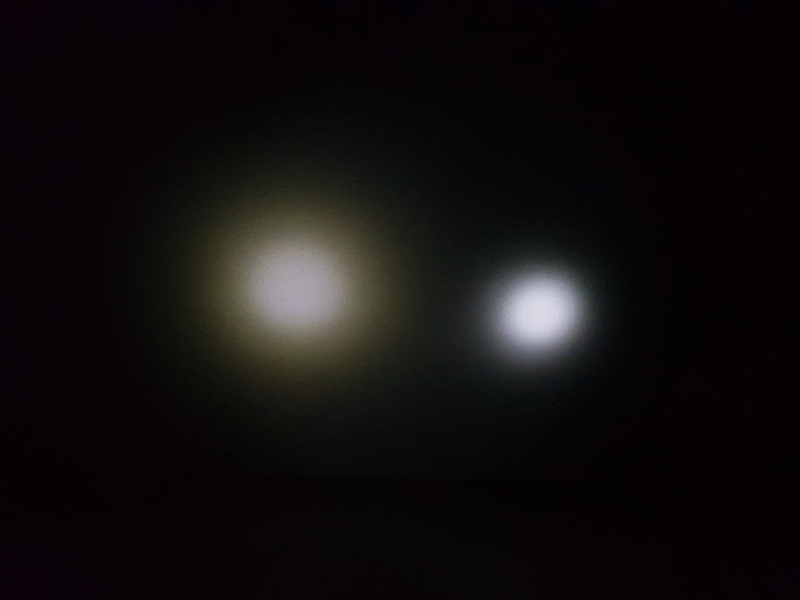 Beamshots: Apologies in advance, they are all taken with a Galaxy Note 8, and all using the 1/24000s exposure time (varying ISO values). All taken on maximum outputs of the respective lights, with fresh cells. VG10S on right, Jaxman M8 on left. VG10S vs Jaxman M8 again. Very obvious yellow donut here. VG10S on left, Nitecore EC23 on right. Yellow donut vs. donut-hole! 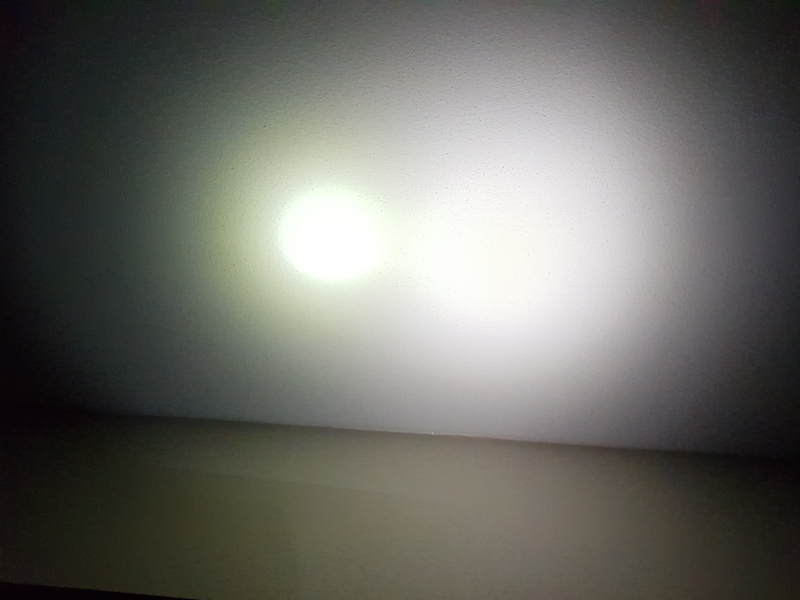 Overall Impressions: I think the smartest thing ThorFire is doing with this light is selling it on Amazon at 22.99. Compared to the stock, old-firmware S2+ I found on amazon at $19.99, it's in a good place. Many of us are getting our chinese lights from china, or at least from Richard, ground shipped from Utah. My prime membership got this light to me in two days for no additional shipping fee. That said, I think the enlarged head puts this light in a difficult place. The second the head got bigger, it got compared to a Convoy C8... and that's where it will lose. 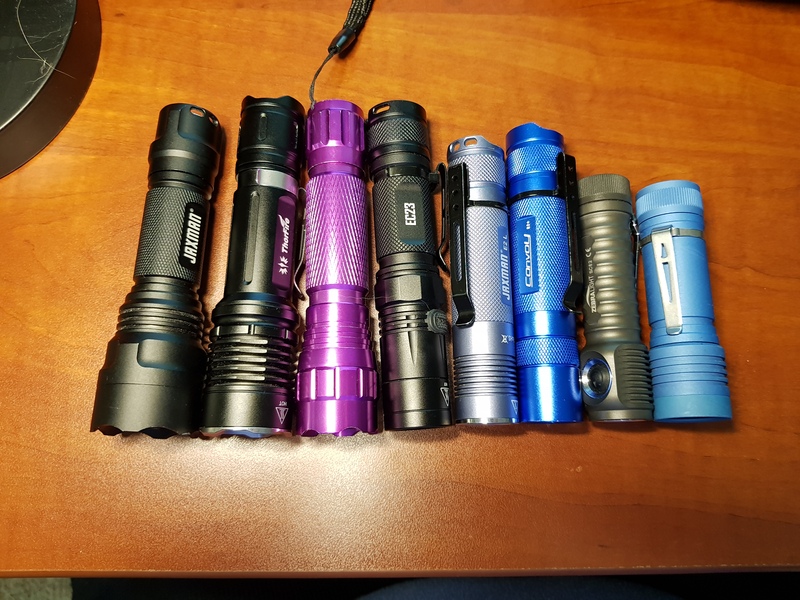 It can't out-throw the larger-headed lights, and it's not out-lumen-ing the smaller toob lights. There's an abundance of tube lights that will hit higher lumen numbers, and with my Nitecore EC23 hitting 1800 it out-throws (or appears to; no lux-meter here) this light even with a dark spot in the middle of the hot spot. But for $23 on amazon and prime-eligible, with a reasonable driver (it even has mode memory), it's in a pretty good spot. 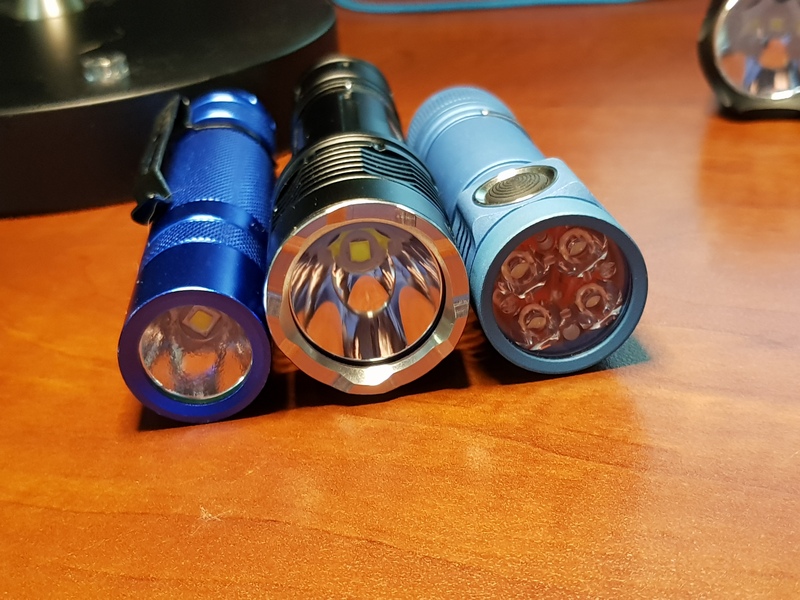 Now, this wouldn't be BLF if I didn't take it apart, right? The switch is simple, and pretty normal. There's a plastic spacer involved, which has a lot of freedom to move sideways. This is where the switch wriggle comes from. The switch boot is smaller than that of my Jaxman M8/E2l/Convoy L6. 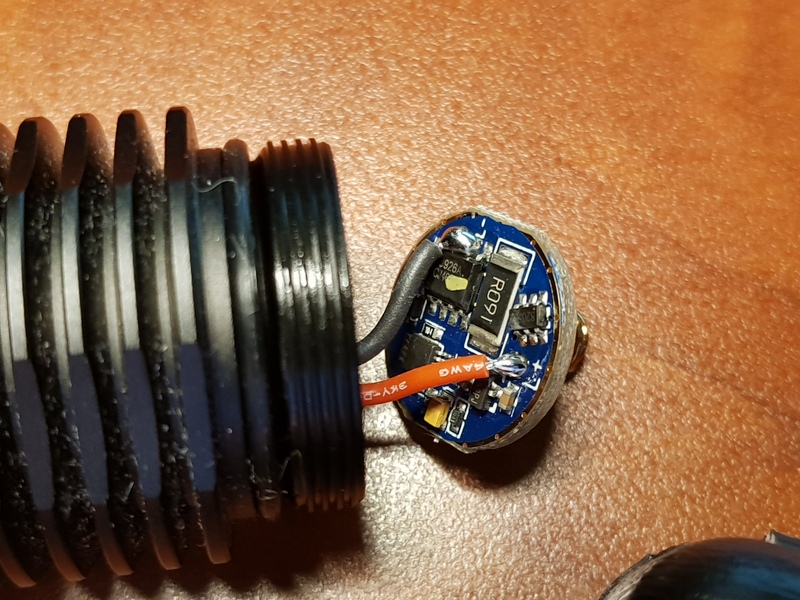 The driver retaining ring is reverse-threaded.The driver fits snugly once the ring is removed, I had to pop it up with teezers but it didn't take too much force. There's a built-in shelf between driver and MCPCB. The driver is 19mm. I've yet to remove the bezel. If I do at some point, I'll update this post. For now, I'm not doing heat and I don't have anything that will grip it well enough without damaging it. I'd love to throw an XP-L HI in it at 4000k-5000k and remove the yellow donut. Probably a fun host. Let me know if anyone opens the bezel. Driver analysis would be cool, too.